Slow cooked chili flavor with a special smoked twist, all in record time! …the last week of October. Yup. We woke up to our first light covering of snow this week, as if October just wanted to nudge us a little reminder of what’s to come in the next month. We already had the heavier coats, hats, and mittens dug out of the basement in preparation, and I can’t tell you how my little Michiganders are excitedly anticipating measurable snow in the coming weeks! Chilly fall evenings definitely call for chili! My slow cooker sprouted chili is a family favorite, but this week set ahead of me just happened to be a bit more packed in schedule than my usual, and I just didn’t have time to get beans sprouting. In fact, I decided one morning that chili just had to be on the menu that night, and that figuring out Instant Pot chili was going to happen! I am so glad I pushed myself to figure it out, because this chili is probably going to take over the family favorite status! It’s a hot debate. And I get it. I’m coming from more of an old school, “love my stove-top cooking” type feeling, and I did have a really hard time adjusting to my Instant Pot. I love the flavor that comes from getting veggie down in fat to sweeten and soften, and the slow simmered flavor that comes from the time and patience that stove-top cooking brings. And slow cookers and chili just go hand in hand because that all day low bubble just makes for amazing flavor. But man, I’m here as a stove-top cooking lover to admit to you that using the pressure cooker Instant Pot the right way gave JUST as amazing depth of flavor as a slow stove top simmer – and gets it done in record time for the busy family. 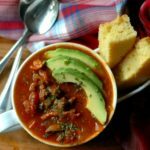 Typically chili is something I save for weekend meals since the prep and cook time take a bit longer, but with the Instant Pot, I was able to have this meal done in record time, and it was so satisfying to serve on a Tuesday night! One of my favorite features of the Instant Pot pressure cooker is the Saute setting. It allows me to get the caramelized flavor out of the veggies that stove-top cooking gives before pressure cooking. While you definitely could just dump all the veggies in and pressure cook it, trust me, the extra 10 minutes of cooking that veg down in some fat makes the flavor SO worthwhile. 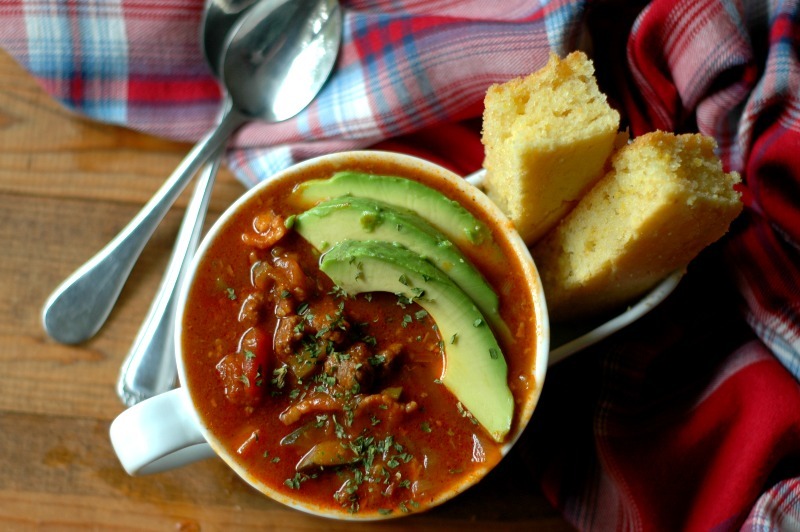 Tips for making this chili all YOUR own, and on a weeknight in record time! I know many people are very passionate about what makes a good chili. I have my list, and yours may look different! If you love a thicker chili, leave out the bone broth. I like a bit more liquid to mine so I can dunk my cornbread or crackers. If you have a certain spice blend that is all yours, do it up! If you prefer beans in your chili, add more liquid/broth and add those beans in there! I don’t tolerate even sprouted beans like I wish I did, and so I’ve learned over the last few years how to enjoy chili without the beans. 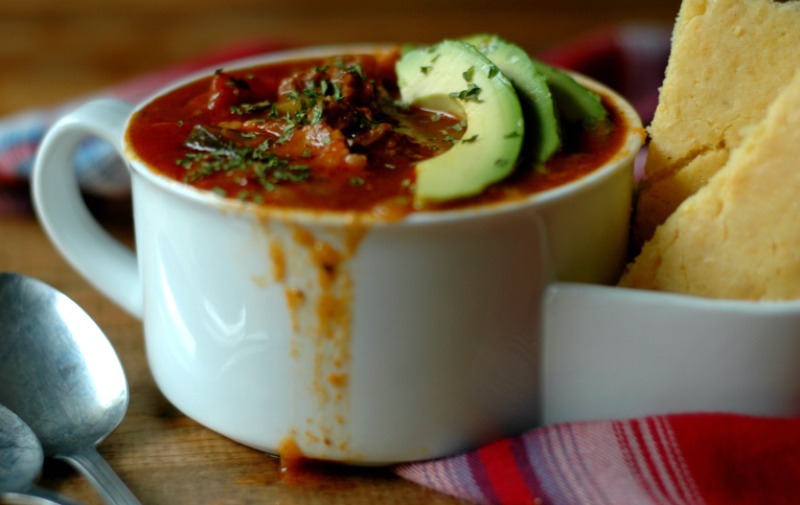 While this chili dinner is not a quite 15 minute meal, it definitely is do-able in 30 minutes with an Instant Pot, or right around an hour-ish stove-top so long as you do a few things in prep the night before or on a prep day! Chop the veggies the night before or on your prep day – this saves you a good 10 minutes between all the veg washing and chopping. Cook the squash for dinner the night before and save the cup you need for the chili so you just have to dump it in. Or save some extra time and use canned pumpkin/squash. Cook the beef and bacon the night before or on your prep day. Just be sure to save the fat to cook the veggies in – that flavor is unmatched! Always have bone broth on your prep day plans. I never let my freezer bone broth stash get below 2 quarts so I’m always ready for making dinners like this. You can also always make the chili on your prep day and then warm it through in a slow cooker or stove-top during the week. If you are serving to a crowd at a gathering, a slow cooker will keep the chili warm all day on the warm/low setting. The chili freezes up great too. My kiddos LOVED taking this chili to school in their school lunch thermos, and my husband took leftovers in his travel crockpot he warms at his desk at work! Here are some weeknight fast toppers and sides for your chili meal! Salads with any of these popular kid friendly dressings, or my personal favorite with this chili is the Olive Garden Copycat dressing. Big veggie platters with clean ingredient Ranch to dip. It doesn’t get any easier than just making a family style platter of veggie sticks to share around, and you can make either this egg free Ranch or my Paleo egg free Ranch dip if you are dairy free. If you can tolerate eggs, we also love this squeaky clean ingredient store bought Ranch from Primal Kitchen. Notes for my Slow Cooker & Stove-Top friends! 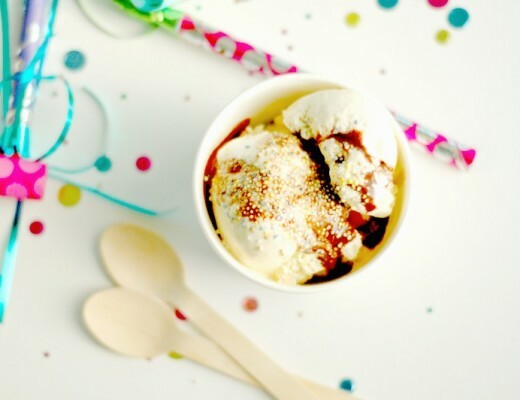 Unless it’s worked into your budget, or coming on a birthday or holiday wishlist, there is no need to rush out and grab and Instant Pot just for this recipe. One of my mantras has always been…don’t go broke trying to eat healthy! I spent quite literally the first 9 years of my real food journey with just a stock pot and soup pot at my stove while I learned how to cook, and you can definitely do this thing without an Instant Pot. If it fits in the budget and you are a super busy family that would benefit from the ease and fast cook times, I think you will be so happy with your purchase! I left both stove-top and slow cooker directions in the Instructions, and you can comment below if you have further questions – I am happy to help! 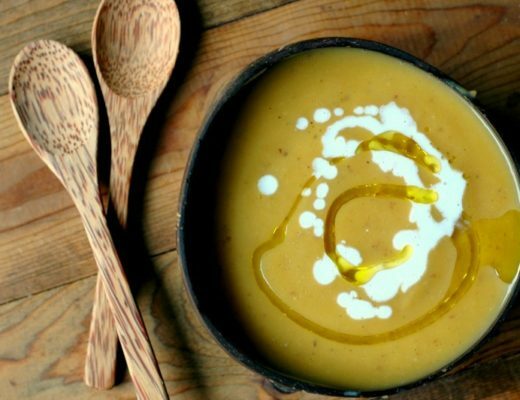 1 cup cooked & pureed squash acorn, butternut, or koboucha work well. I think canned pumpkin would be fine too. Brown the beef and cook the bacon in 1 tablespoon of ghee or other friendly cooking fat. If you are using an Instant Pot using the “Saute” feature to do this. If you are using your soup pot, cook over medium heat until cooked through. Scoop the meat out with a slotted spoon so the fat stays behind for cooking in. Add the rest of the cooking fat to your IP or soup pot and sauté the onion and peppers with a pinch of sea salt for about 10 minutes until soft and sweet. Return the meat to your IP or soup pot along with the rest of the ingredients. Give the chili a stir to combine. IF YOU ARE USING THE INSTANT POT, put the lid on, close the valve, press “Manual,” and bring the time to 15 minutes. The IP will take about 5 minutes to come to pressure, and then will pressure cook for 15 minutes. When the pressure cooker beeps that it is done, turn it off and let the pressure release naturally about 5 minutes before opening the lid. IF YOU ARE USING THE SOUP POT, put the lid on and bring to a low simmer for about 1 hour. You could alternatively use a slow cooker from this step cooking on low for 6-8 hours. LOVE this for fall and all of the chilly months! See what I did there 😉 Every time I see these bowls that you have, I wish I had them too. They are so cool! 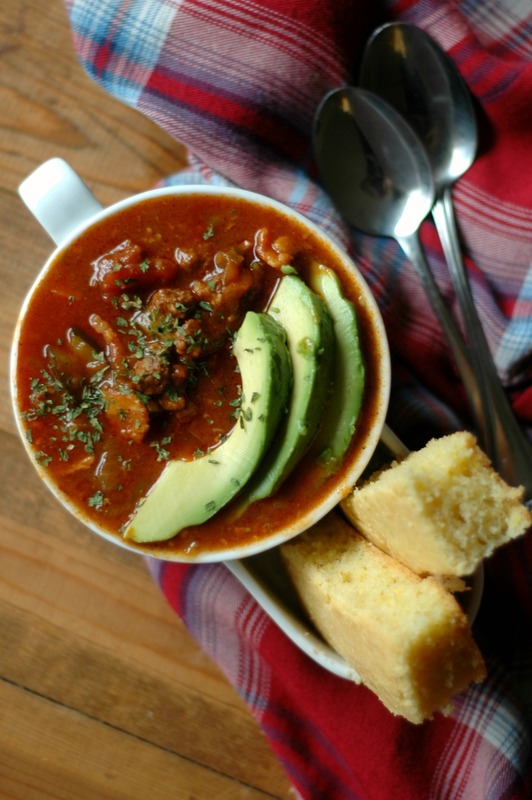 Perfect for that side of cornbread … my favorite with chili. This looks delicious Renee! So yummy. This is so my style! I’m going to make this very soon! I forgot that October snow was a thing! Wow. Chili sounds perfect. Yours with bacon and the smoky sounds lovely. Such a comfort food. Yum! So hearty. And you know I love those avocados! Just got me an instant pot! Can’t wait to try! 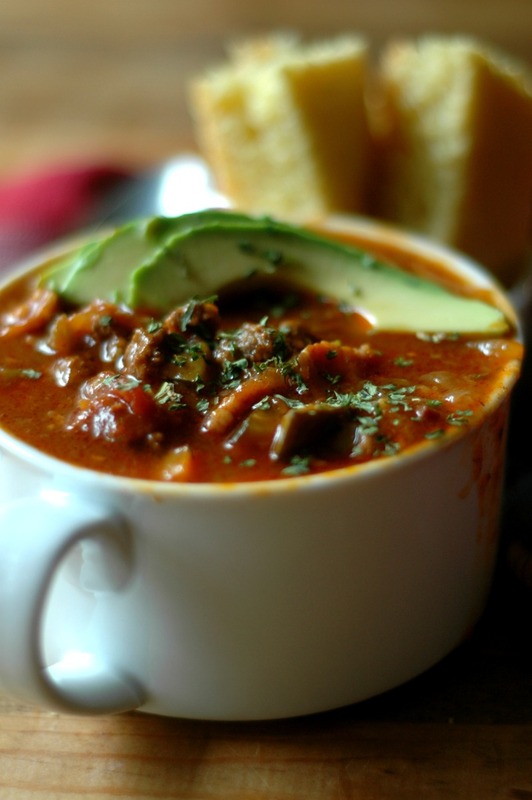 I just made something similar and this type of chili is all I want these days with the cooler weather. Love the addition of bacon! I do look forward to fall every year because it’s time for chili! 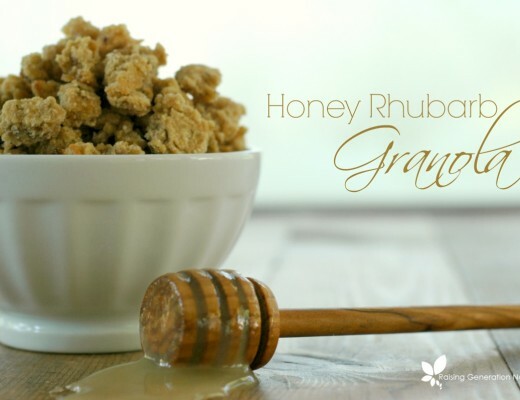 This looks delicious and I’ll be giving this recipe a go soon! Craving chili so much! And I love your photos – I always slice avocado into my chili bowls and my family look at me like I’m weird! Looks fantastic, love this recipe. This looks amazing. 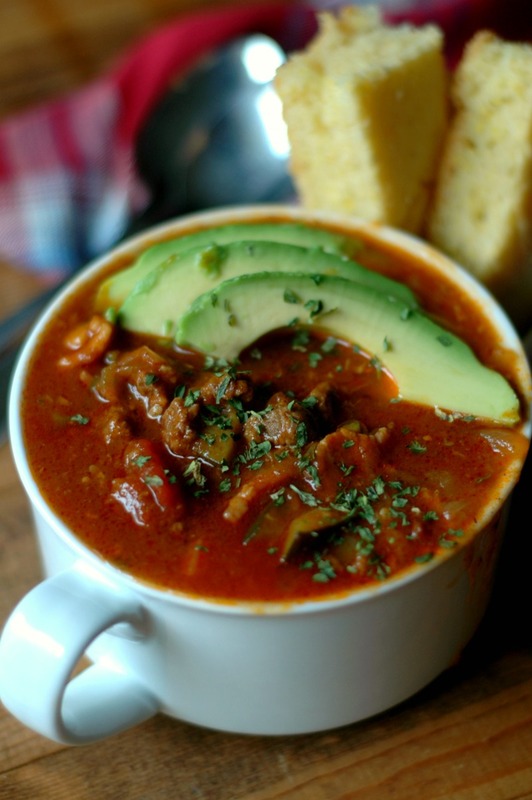 I love chili and can’t wait to make this. YUM!! 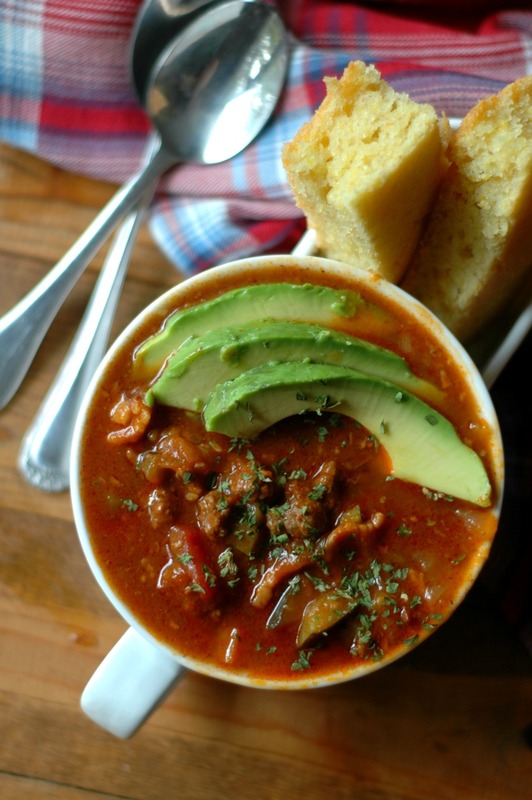 A bowl of this chili would be perfect for today! Love the addition of chipotle! Man, I passionately love my instant pot. So great for beans, thanks for all the tips! I move next week, and the instant pot is the only cooking appliance I’ll have for a couple days! Renee this is AMAZING!! My family loved it, plus so so easy in the blessed IP! Love that Bethany! Thank you for coming back to let us know! I have been craving chili the past couple weeks! This sounds so delicious, I have never used bacon in mine before but how can it not be good because, well, it’s bacon. Oh this looks so good! I bet the chipotle gives it the nicest smoky flavor! Another Instant Pot gem, I love it. Must be so rich and tasty! You are the queen of easy comfort food. Love all your recipes. Thanks for sharing ! Yum! I’m all about a beanless chili and I love the chipotle in yours! This is so satisfying! My husband will love this. I just can’t wait to get my instant pot. This is excellent! I just can’t call it chili for the purist in the house! There’s was no way with my toddler on my hip that I could pour out the meat though so I did the bacon, added peppers and onions to that then added beef then rest of veggies and it worked great – including with canned pumpkin! That’s great Vanessa! I’m so glad you enjoyed it! 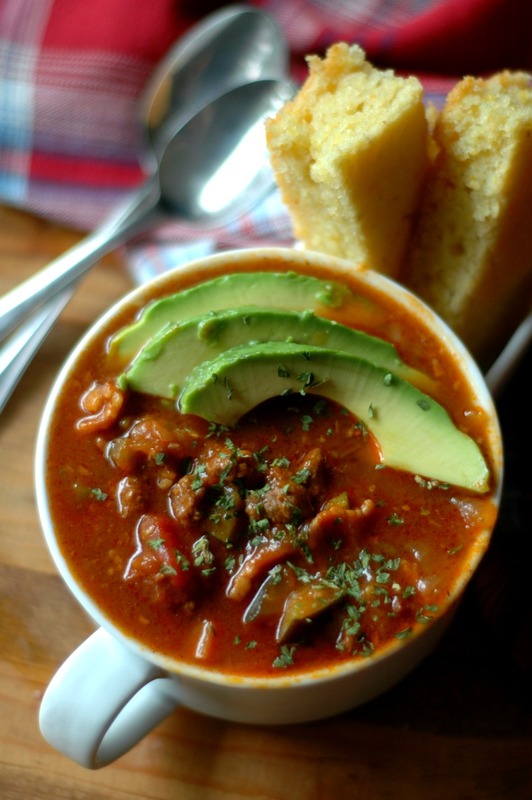 It is definitely chili weather and this recipe is on my list to make this week, I love chipotle! Made this recipe last night. It had a wonderful depth of flavor. It is in my top 5 recipes for the Instapot. Hi Nicole! That’s great! We enjoy this one too! If using the instant pot (new user), can you saute the hamburger and bacon together and then just leave in and continue on with recipe? Hi Linda! I would cook the meat and take the meat out so you can give the veggies some time to saute. The meat would get too cooked if you kept it in – and you want to give that veg some time to saute and get nice and sweet.